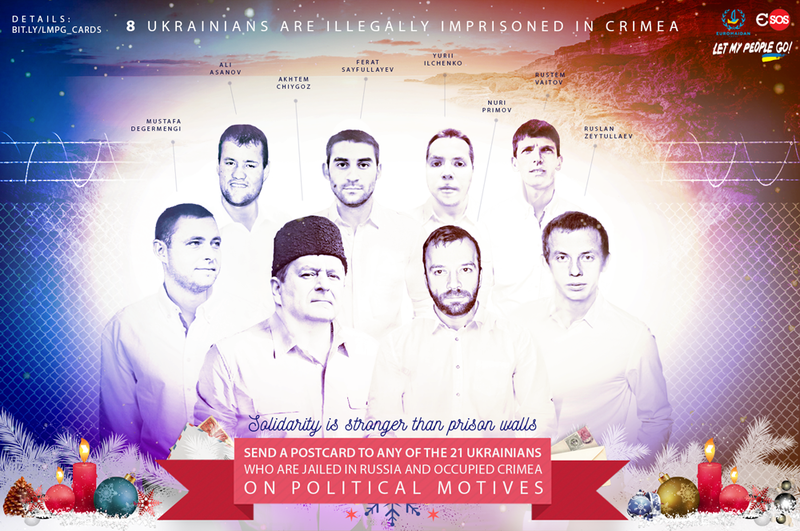 13 Ukrainians in Russia and 8 Ukrainians in occupied Crimea. People all over the world are sending them post cards and letters as part of the holiday marathon of the #LetMyPeopleGo campaign. 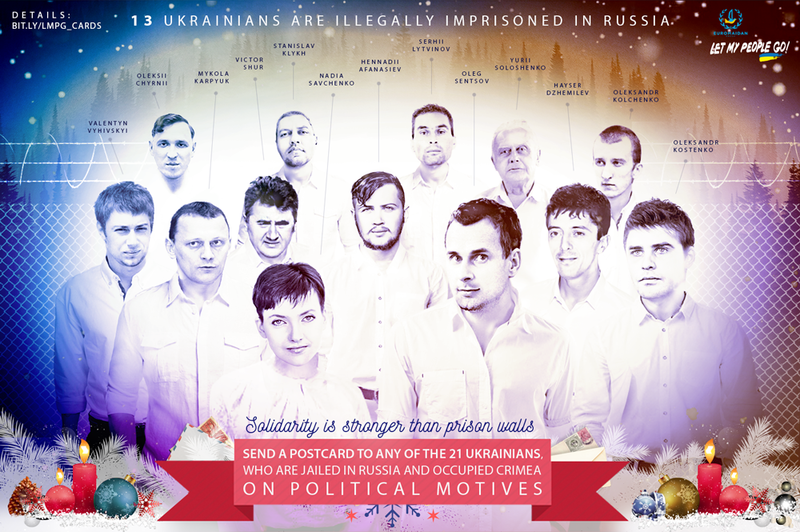 But there is a problem: the prison guards in Russia only deliver letters and cards written in Russian. Moreover, they have to be of neutral content. Recently, the book of Nobel laureate Svitlana Alexievich was not delivered to Nadiya Savchenko due to its “extremist” content. Nevertheless, even a few words of support will mean the whole world to the Kremlin’s hostages, many of whom have been tortured, kidnapped, some of whom have been sentenced to decades of prison. We’re sure that they will be glad for a postcard without words. But considering that some of our readers would like to write something, we invite you to seize the opportunity and “kill two rabbits with one shot,” as we say in Ukraine – write a postcard AND study Russian! Here are some examples of greetings you can send and an explanation of their translation. Дорогая (…)! Daragaia (…)! Dear (woman’s name here)! Дорогой (…)! Daragoi (…)! Dear (man’s name here)! С Новым Годом и Рождеством! S novym godam ee rojdestvom! [I greet you] with New Year and Christmas! (И means and; The Russian word for Christmas, Rojdestvo means, literally, “the nativity”). С Новым Годом! С Рождеством! S novym godam! S rojdestvom! [I greet you] with New Year! [I greet you] with Christmas! Желаю тебе сил и стойкости в Новом Году! Jelaiu tebe sil i stoikosti w Novam Gadu! I wish you strength and perseverance in the New Year! Желаем сил и радости. Jelaiem sil i radosti. We wish you strength and happiness. Пусть благословит тебя Господь! Pust blagaslavit tebia Gaspod! Let God bless you! Мы надеемся, что в 2016 ты вернешься домой! My nadeiemsia, chto v 2016 ty vernioshsia damoi! We hope that in 2016 you will return home! ждем твоего возвращения на родину! Jdiom tvoievo vozvrascheniia na rodinu! We await your return home! (the word na rodinu literally means to the motherland, rodit means to give birth). Помним про тебя. Pomnim pro tebia. We remember you. Думаем про тебя. Dumaiem pro tebia. We are thinking about you. Желаю тебе сил и стойкости в Новом Году! Мы надеемся, что в 2016 ты вернешься домой! ждем твоего возвращения на родину! надеемся, что ты скоро вернешься домой! Мы тебя любим и ждем!